After a picnic lunch (yes, a picnic -- we had a gazebo with a wood fire burning so it was cozier than you might expect) we transferred into a big park bus for the six hour drive to our lodge. I think we were all more excited about spotting moose or maybe grizzlies than we were about the scenery. I thought we'd see some pretty mountains. I hoped we'd see Mount McKinley, despite the overcast skies. The problem here is strictly editorial -- I could easily post forty or fifty stunning landscapes. 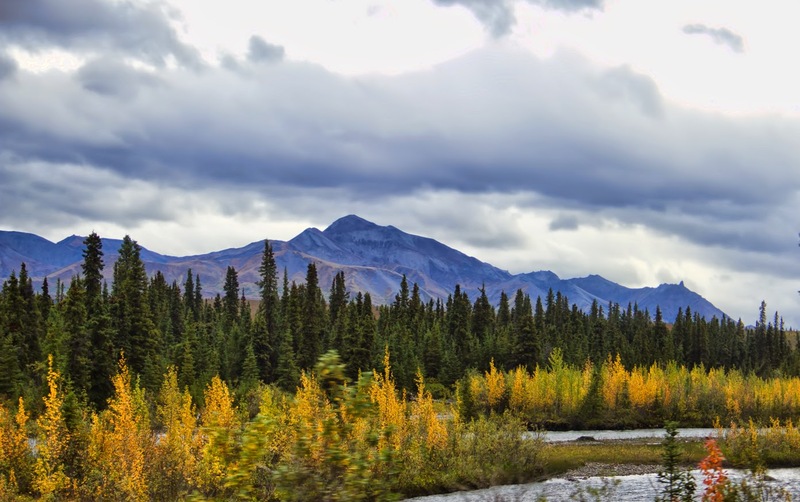 The sun came and went; it got darker, then lighter; taiga gave way to tundra; and I was mostly shooting through a bus window while bouncing around a gravel road, and yet the pictures almost -- almost -- do justice to the jaw-dropping scenery around every bend of that road.